Click the banner below to listen to the audio review on demand. Runtime:149 min., Rated PG-13 for sequences of intense action and violence, and some suggestive material. Does lightning ever strike twice? Yes it can. Many tall buildings have lightning rods which lightning can strike numerous times during a thunder storm. So given the right conditions, lightning can strike twice, three times, or more! 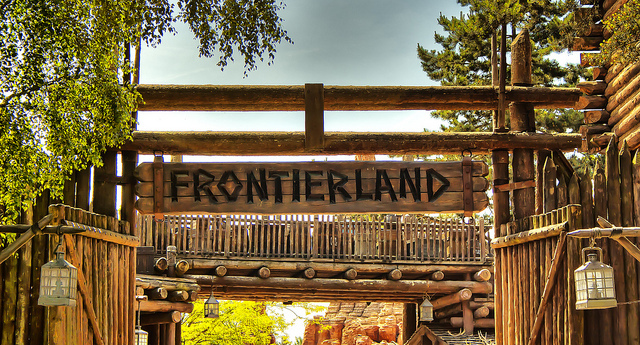 This seems Disney’s genuine hope and plan with The Lone Ranger —that the lighting which struck with the first Pirates of the Caribbean movie Curse of the Black Pearl (2003) would strike again and help bring new life to Frontier Land at their parks, sell piles of toys, and bring forth a number of sequels. 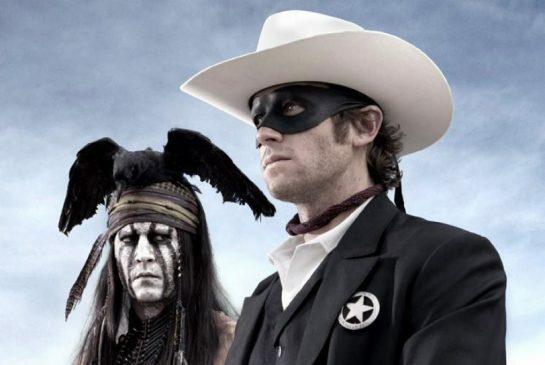 By putting together all the right conditions: same producer, Jerry Bruckheimer; same director, Gore Verbinski; same main actor, Johnny Depp playing Tonto; most of the same writers; even the same composer, Hans Zimmer, Disney set the stage, struck up their most nostalgic band and waited for the lightning to strike the second time. And then— it didn’t happen. No electricity on the big screen this time out. There are a number of reasons for this. First, the movie suffers from an identity crisis. It can’t decide if it’s a comedy or a tragedy. It’s campy, but also too violent for its PG 13 rating. Second, it’s bad at geography. 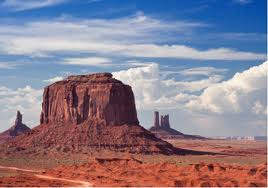 Everything is shot on location in the Monument Valley area in Utah yet the story is set in Texas. While this makes for a beautiful visual setting, some viewers will find it irritating. Third, and most important, the aboriginal peoples of North America are not well respected. The movie conflates different native cultures and traditions into a single caricature and does little to help other stereotypes rooted in North American history. The Asian and African communities are two dimensional and poorly presented. Women likewise receive short shrift. Were these concerns present in Pirates of the Caribbean franchise? Probably, but these hit a lot closer to home, as a result The Lone Rangerfalls flat. Also Disney is known primarily for its production of family films and while Disney hasn’t had the overall best track record when it comes to cultural sensitivity it is still regarded as a family friendly movie studio. Keeping all this in mind it’s somewhat strange that the film World War Z, which is also in theaters right now, has better family values than The Lone Ranger. Spiritually speaking, The Lone Rangeris also conflated, freely mixing Native American belief systems into a messy pastiche. And Christians don’t fare much better. Near the beginning of the film a train car full of Presbyterians are depicted as clueless do-gooders unprepared for the “realities” of the harsh world of the “Old West.” From the get-go Christian prayers are depicted as unable to stop bullets while native spirituality is shown as superior, since it is the spirituality that shields the Lone Ranger from enemy bullets. In a post-modern twist, Comanche chief (Saginaw Grant) reveals that the spirituality taught by Tonto is suspect and not believed by other Comanche warriors. Basically this puts everything Tonto says into the same column as the Presbyterians meaning that, as far as the film’s worldview is concerned, the bullets that narrowly missed the Lone Ranger did so by dumb luck and not by supernatural protection. Yet at the same time, some of the things Tonto does are depicted as supernaturally effective. Perhaps this is all just Tonto’s “truth” since he is the film’s narrator and he tells the story in flashbacks. This movie feels as though it’s hedging its bets and trying to have its cake and eat it too. The main supernatural element of the film is the idea that the man who becomes the Lone Rangertakes on this identity because he’d died and was brought back to life by the “Great Father” as Tonto puts it. This too is presented as suspect. Scripture does talk about people come back from the dead: the widow of Zarephath’s son; the son of the Shunammite woman; the widow of Nain’s son; Jairus’ daughter; Lazarus; Eutychus, who fell from the window after falling asleep during a really long sermon; and the woman Tabitha. When John Reid (Armie Hammer) is raised from the dead it’s not meant to be a public act that draws people to faith as you find it the Bible. Rather, when John Reid becomes the Lone Rangerhe is told to hide his identity with a mask to keep others from knowing he was back from the dead. Tonto advises Reid that as far as his enemies are concerned it’s “better you stay [dead].” The amazing nature of a person back from the dead is never fully explored. The Lone Rangeris no zombie; he’s a living breathing revivified man, yet this is not well considered. Since the film equally misrepresents every religious belief system it presents, the Christian, and anyone who believes firmly in any of the many forms of Native Spirituality indigenous to North America, will find all aspects of the film’s spirituality frustrating. The odds of anyone walking out of that film saying, “Finally, a movie that puts on the big screen just what I believe!” are astronomically low. In the end, this is not a good movie. It’s not the worst movie; it’s simply mediocre. As an action film it has exciting action but it’s often drawn out with poor pacing. Overall, the film is about 45 minutes too long. The acting is uneven and the script is confused, heavy-handed and ham-fisted. Disney’s The Lone Rangeris better than Will Smith’s Wild, Wild West, but doesn’t come close to Westerns like Silverado, or either the old or new True Grit movies. If you have seen the film or are planning to, the best construction to put on it would be this: You have 149 minutes to think about what Jesus means when He says, “Love your neighbour as yourself.” Sadly, the writers didn’t take the same care depicting the various cultures in the film as they would have writing about their own. Since the film is so confused, it’s hard to say how seriously the film makers wanted their audience to take the film. It seems they would like the movie goer to take it about as seriously as the price of admission and some refreshments from the concession stand. Rev. Ted Gieseis associate pastor at Mount Olive Lutheran Church in Regina, Saskatchewan. Hans Zimmer didn’t write the music for the first Pirates of the Caribbean movie, but was the composer for the second Pirates of the Caribbean: Dead Man's Chest and for all the Pirates of the Caribbean subsequent films.